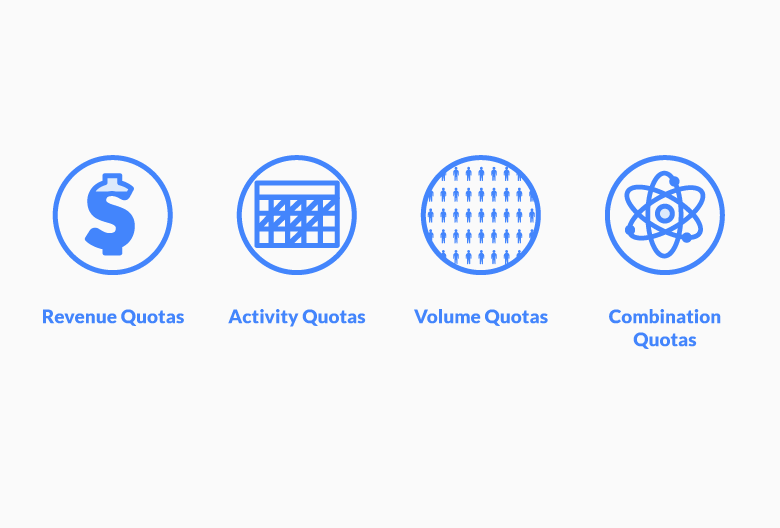 What Are Sales Quotas (and Why Does Your Sales Team Need Them)? It’s hard to make progress without first setting a clearly defined goal. After all, benchmarks give us something to strive for and help us recognize when we’re improving. For sales team, sales quotas act as a benchmark and can provide the motivation reps need to perform their best and support the business’ goals. 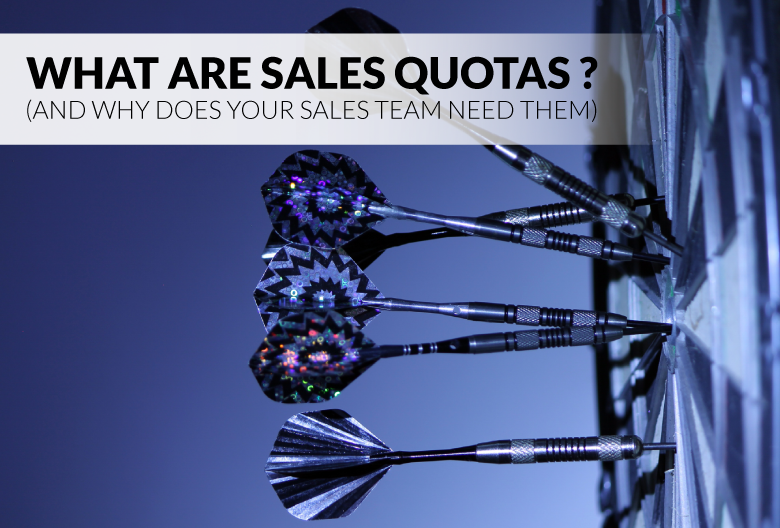 Many sales teams thrive with the help of quotas. The key is to set quotas that are both challenging and attainable. What is a Sales Quota? A sales quota refers to a time-bound sales target set by management for a particular region, sales team, or individual rep. Sales quotas are often attached to a daily, monthly, or quarterly period. Sales quotas can be measured in a number of different ways, including by profits, sales, or rep activity. Not only do sales quotas play an important role in sales forecasting and monitoring rep activity, they also set expectations and motivate sales reps to hit a given level of activity. Managers can also use sales quotas to learn more about their team’s productivity, success rate, and optimal sales processes. Before deciding how to set sales quotas for your team, you need to understand the different four main types of quotas. Sales quotas are often based on revenue, sales activity, volume, or some combination of the three. The most common type of sales quota is revenue-based. Reps are expected to sell enough units or subscriptions to earn a certain amount of revenue for the given period. This type of sales quota is usually set for the quarter or the month. However, businesses in industries with a longer sales cycle might use annual revenue quotas. For instance, since many SaaS companies operate on monthly contracts, they might choose to set quotas based on the value of the client’s annual contract. Revenue quotas can refer to net revenue, especially in cases where prices are flexible and upselling is common or expected. If your products have a range of different profit margins, you might use profit quotas instead of focusing on revenue. Profit quotas incentivize reps to spend time selling items that yield a higher profit. Another option is to create quotas based on sales activity. This can include the number of new clients landed for a given period. However, it can also expand to include activities that are part of the sales process but don’t translate directly into sales. For example, reps might be expected to make a certain number of phone calls every week, book a certain number of meetings per month, or close a certain number of deals by the end of the quarter. Quotas based on volume incentivize reps to move a certain amount of inventory or register a certain number of new users. These types of quotas are often set for the team to achieve over a given year. Depending on the business, the quota might break down further by region, product, or individual sales rep. Many sales teams operate with some combination of sales quotas in place. Combined quotas often involve an aspect of both sales volume and rep activity. For instance, reps might be asked to set ten appointments with new prospects and close 40% of those leads for a total of four new customers. However, setting too many different types of quotas can be problematic if it causes your sales team to become unfocused. When in doubt, prioritize a select few activities or benchmarks that you want your team to prioritize, rather than asking everything of your sales reps. Some managers assume that setting the bar as high as possible is the best way to get results. Because, hey, even if the team falls short, they’ll still have a pretty good quarter. Unfortunately, this isn’t how sales quotas work at all. In fact, setting an unrealistic sales quota can actually deplete morale and damage productivity – which, in turn, hurts profits. Think about it: if your sales reps know the quota you’ve set is unattainable, why would they even try to reach it? Asking more of your reps than is possible is guaranteed to make them feel like failures, even if they’re killing it. Other complications can arise from setting unfair sales quotas. For example, your sales reps might resent the company for creating a toxic environment, which leads to increased turnover and bumps up costs associated to rehiring and training. Unrealistic sales quotas can also encourage unscrupulous behavior. Desperate sales reps might resort to overly-aggressive sales tactics, mislead their prospects to make more sales, or fudge the numbers to suggest they closed more deals that they actually did. On the other hand, a challenging but achievable quota incentivizes reps to try their hardest without burning out. Your reps should be recognized for their hard work, so make sure your compensation plan keeps them motivated and rewards them generously for making or even beating their quota. Now that we’ve established why sales quotas need to be attainable yet challenging, let’s discuss how you can go about setting fair quotas for your sales team. The two primary approaches to creating sales quotas are the top-down and the bottom-up approach. The top-down approach essentially means the company sets a goal for the quarter or period (for example, we want to earn $10,000 this month) and then assigns sales quotas to support this goal (i.e. each of our five sales reps must bring in $2000 so we hit our target). When quotas are created using a top-down approach, management comes up with the numbers based on the organization’s objectives. Whether these are determined by comparing your business to competitors or by analyzing historical data, a top-down approach begins with a desired result and works backwards to figure out how much your reps must sell to achieve it. For instance, if the goal is to earn $10,000 revenue this month and the average deal size is $500, then your sales team needs to close twenty deals by the end of the month. Depending on the number of reps on your team, you can assign individual sales quotas in terms of number of deals each rep must close or the amount of revenue they each need to bring in in order to meet your goal. Generally speaking, sales quotas increase as a business’ average deal size goes up. Unfortunately, can sometimes lead to unrealistic quotas if your reps are expected to hit higher and higher quotas over time. Alternatively, a bottom-up approach involves looking at what each rep is capable of and analyzing historical data (like how much each rep sold last month) and then creating quotas based on those numbers. 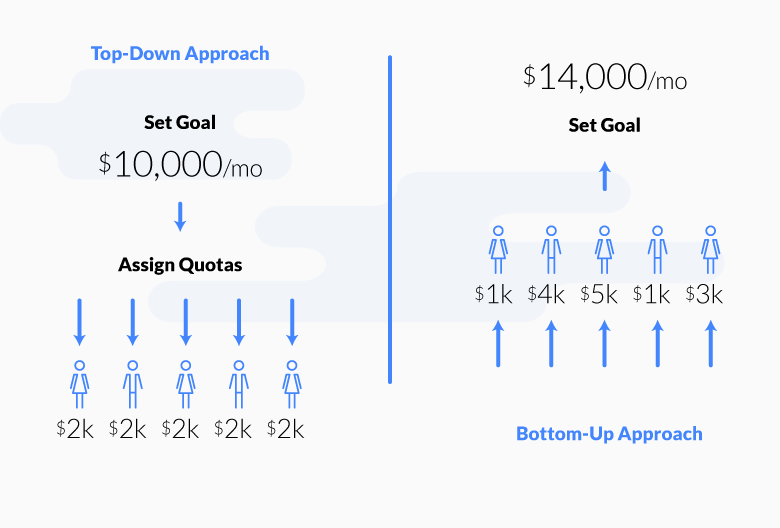 Since an ideal sales quota is challenging and realistic, you should use the bottom-up approach to come up with a quota at the upper bound of what your reps are proven to be capable of selling. If you want to create sales quotas using a bottom-up process, start by figuring out how many deals each of your sales reps can reasonably close in a given month. For example, look at previous periods to see what the typical closed-won rate was and use that data to forecast for the coming period. Then, multiple that number by the average deal size to get a rough idea of what you can expect from your salespeople. Quotas created using the bottom-up approach are often more realistic, balanced, and attainable than those set using the top-down method. Remember, reasonable sales quotas keep everyone happy – they’re good for management, your sales reps, and the company – so it’s worth considering a bottom-up approach. Here’s another way to help reps achieve their sales quotas: give your team the tools they need to succeed! That includes a powerful CRM platform that enables them to send personalized, effective cold emails. And since more effective sales start with better cold email campaigns, we’ve put together a package of 17 proven cold email templates that you can share with your team.